When confronted with the question “Whose History Is it Anyway?”, during a seminar revolving around forms of monuments and visual representations of history, we were struck by the limitations of fixed visual language. We encountered countless examples of monuments fading out of the public eye and becoming irrelevant, endless empty visits to sites without any real engagement in the meaning of the space, and the co-option of monuments by different groups or individuals as a symbol for something other than what was originally intended. We repeatedly found that no visual language or fixed form could be counted on to mean the same thing to people across times and contexts, nor could any static form promise to be monumental enough not to fade from public interest. It seemed to us that the best way to contend with the reality of the limitations of monuments and static forms was to not only accept, but to embrace the changing meaning and status of monuments. We realised that what allows monuments to carry meaning and remain relevant are public rituals and engagement. But rather than settle for Ritual, which seemed to us a tool for allowing only one type of involvement by a narrow group of people, we arrived at the concept of Counter-Ritual, that is, an invitation for anyone to engage with a monument and contest its meaning. To this end, we created a project intended as an invitation to the public to engage with monuments and history with their own agency. The following is the theoretical text behind our project; we encourage you to read this and participate in the project. In 2000, a memorial—a tear-shaped fountain—was erected in Hakasalmi Park to commemorate the eighth and longest-serving president of Finland, Urho Kekkonen. However, over the years the fountain acquired a different function: it became a sort of public bathing pool for the homeless. After many years of this misuse of a national landmark, the Finnish government was compelled to install a staircase to facilitate safe exits from the fountain. Maarjamäe Memorial in Tallinn is a Soviet park constructed in 1975 where more than 3000 soldiers had previously been buried during the German occupation. Today, Estonians have engaged in a debate on whether the memorial should be demolished (as a symbol of an oppressive regime) or kept (as an architectural and cultural milestone). Some people have also proposed to simply change the meaning of the memorial. In an ongoing protest against police brutality and racial inequality in the United States, football players—most notably Colin Kaepernick—have kneeled during the pre-game playing of the national anthem, in defiance of the custom of standing with hand over heart. In 2007, Mexican artist Damián Ortega installed his ‘Transportable Obelisk’ in Central Park, New York. A six metre-high obelisk on a wheelable base, easily moved from one location to another, this mobile landmark illustrates the ‘Napoleonic gesture’ of erecting (and stealing) monuments as a sign of victory of ever-changing global powers and regimes. In a former military jet now erected as a monument commemorating Pakistan’s victory over India in 1965, Ayesha Jatoi hung wet red clothes to dry under the sun: a performative action to protest the glorification of the Pakistan military. What all these actions, gestures, performances, and everyday occurrences tell us is that monuments, against all odds, against their solid, enduring, unyielding materials, might not be as static as we tend to believe. They tell us that monuments can be brought to life again—or were they ever alive?—that they can be actualised, reconfigured, contested, transformed; that their venerable facades can be penetrated, allowing for a space where we can participate in a conversation with our history. “Sacralised memory admits neither debate nor revision1”. Sacralised memory is also an authoritarian memory. While monuments are often meant to reflect collective memory or solidify a nation’s identity, the power to actually erect a monument is limited to the prevailing government and the ideology it represents. If all the work of remembering and defining meaning has been assigned by the regime to the form and physicality of the monument itself, does the monument’s presence invite non-action? If the public is intended not to add, define, or counter the meaning of a monument, does the role of the visitor become a passive receiving of meaning, paying respect, and leaving? Does the monument then absolve us of the “obligation to remember”? What then is the purpose of visiting monuments? Visitation can be defined as an act of ritual. Ritual enshrines meaning through repeated empty acts, adding to the sacralisation and impenetrability of a monument. Counter-ritual, then, can be defined as a series of acts that un-enshrines meaning, desacralises a monument, and builds up new or different meaning. Counter-ritual can be performed by anyone with or without authority, and by its dependence on human acts and human presence, can never be static or permanent but infinitely variable and contestable. Counter-ritual acknowledges that no static visual language or form can or should carry fixed meaning. By allowing for a multiplicity of authors, intentions, actions, and durations, counter-ritual defies the authoritarianism of the monument and reclaims it for the public sphere as something living, active, mutable, and contestable. The examples mentioned at the beginning of this text function as counter-rituals that have actualised monuments in several different ways. From corporal and performative actions that bring attention to problematic events in our society, to artistic gestures that comment on the problematics of history and memory, these all prove that monuments are not static, or that they should not be static. When we engage with a monument—when we decide that the act of remembering is our own responsibility, and not that of a stone—we are able to contest the meaning of history, to debate what it means for us today, and accept that its meaning will always be in an ever-changing state of metamorphosis. “The surest engagement with memory lies in its perpetual irresolution2”. 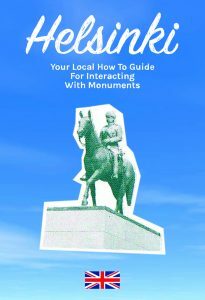 Helsinki: Your Local How To Guide For Interacting With Monuments (click to download) is a booklet that contains a playful yet critical guide about: the definitions a monument can have, who decides the meaning of monuments, and how that meaning can be perpetually transformed. Illustrated with diverse examples of how governments, artists, activists, and (most importantly) people have actualised and modified the meaning of a monument, it tries to demonstrate that when we desacralise monumental history, when we renovate our rituals around monuments, it is possible to contest history and start a conversation with the past and also with the future. The booklet is also a folded poster with a map of Helsinki City Centre that depicts the location of several national monuments with which the reader might start a “critical tour”. Disguised as an institutional publication, and edited by the National Department of Participatory Cultural Engagement; Regulation; and Management of Federal Landmarks, Sites of Memory, and Spaces of Collective Remembrance, the booklet will be implanted in different institutions and tourist booths around Helsinki to encourage critical reflection around the concepts of monumental history and sacralised memory, as well as to actualise the everyday relationship between historical monuments and the citizens and visitors of Helsinki. The blog http://www.thendpcermflsmscr.tumblr.com archives the booklet and the research behind the project, and also serves as a space for prospective readers to share their own reflections. *This project was part of the exhibition Whose History Is It Anyway? at Aalto University during January and February 2018. 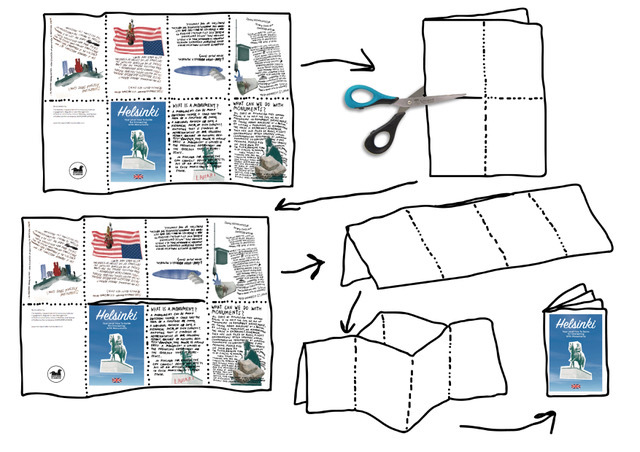 The file for the booklet can be found above, as well as printing and folding instructions. Else Lagerspetz is a designer interested in the intersections of art, fiction, and graphic design. She holds a BA from the Estonian Academy of Arts and co-runs the non-existent publishing house Knock! Knock! Books. Essi Ruuskanen is a street artist who also works as a community educator and in the collectives Street Art Vantaa and G-Rex. Her biggest inspiration comes from seeing individual stories emerge in shared spaces, and public walls transforming into active contributors to daily life. Paola Jalili is an independent researcher and editor with an academic background in literary studies. She is interested in independent and experimental publishing, cinema, intersectional feminism, contemporary poetry, and Latin American art. Saara Mahbouba is a visual artist with a background in Art History from New York University. She has also worked with galleries and art-based NGOs. Her work centres around the intersection of identity formation, theory, and visual culture. Sheung Yiu is a self-taught independent photographer. His work explores the many facets of photography in contemporary visual culture. His main interest lies in the visual literacy of scientific imagery and the social construction of ‘scienceness’. Else, Essi, Paola, Saara, and Sheung are currently pursuing an MA in Visual Culture and Contemporary Art at Aalto University. 1 Abramson, Daniel. “Make History, Not Memory”. Harvard Design Magazine. No. 9. Fall 1999. http://www.harvarddesignmagazine.org/issues/9/make-history-not-memory. 2 Young, James E. “The Counter-Monument: Memory against Itself in Germany Today”. Critical Inquiry. Vol. 18. No. 2. Winter 1992, pp. 267-296.